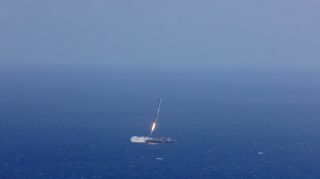 The first stage of SpaceX's Falcon 9 rocket attempts to land on a robotic ship on April 14, 2015, shortly after sending the company's Dragon cargo capsule to orbit. SpaceX nearly pulled off an unprecedented rocket landing during a cargo launch to the International Space Station, NASA's Curiosity rover found evidence that liquid water flows through Martian soil on cold nights and the New Horizons probe returned its first color image of Pluto. Here's a look at Space.com's top stories of the week. Mystery of Saturn's 'Great White Spots' solved? How do Saturn moon Titan's huge dunes form? Another ringed body in the solar system?